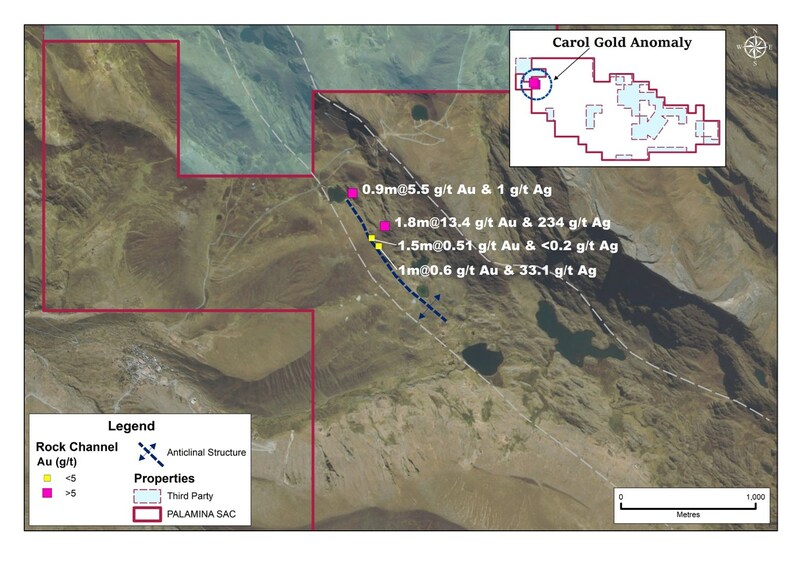 Toronto, Ontario--(Newsfile Corp. - October 29, 2018) - Palamina Corp (TSXV: PA) has completed heliborne geophysical surveys over its Coasa, Gaban and Cori gold projects in the Puno Orogenic Gold Belt ("POGB") of Peru. In the POGB, gold mineralization frequently has an association with disseminated magnetic pyrrhotite hosted by quartz veins within regional shear zone structures. Palamina believes results from the heliborne magnetic survey will aid in outlining regional structures with the potential to host gold mineralization. It will also help focus on-going ground exploration by identifying the most prospective sections of these structures. Raw geophysical data acquired from the surveys is being processed and the company anticipates receipt of the processed data shortly. Andrew Thomson, President of Palamina stated, "Palamina is the first company to conduct heli-borne geophysics in the POGB. The ~3,000 line-km survey is now complete and we are awaiting the processed data to better understand the structures of the Coasa, Gaban and Cori gold projects. The combination of survey data plus on-the-ground geological knowledge should help Palamina better pinpoint prospective exploration target areas. Recent sampling campaigns at Gaban and Bendi continue to increase our understanding of the mineralized shear zone structures on these properties." Gaban Gold Project: Palamina holds title and application rights to 19,300 hectares at Gaban where 10 sets of alluvial miners intermittently mine coarse alluvial gold from the Yanamayo river within the property. Geochemical stream sediment sampling has returned values up to 4.9 g/t gold (at -60 mesh) in the Yanamayo river. Palamina has secured the mining rights to 85 % of the Yanamayo river watershed which is bound on all sides by four mountain ridges. Results from the recently completed heli-borne magnetic survey will serve to better understand the structural orientations and anatomy of the 5 shear zones located to date at Gaban. 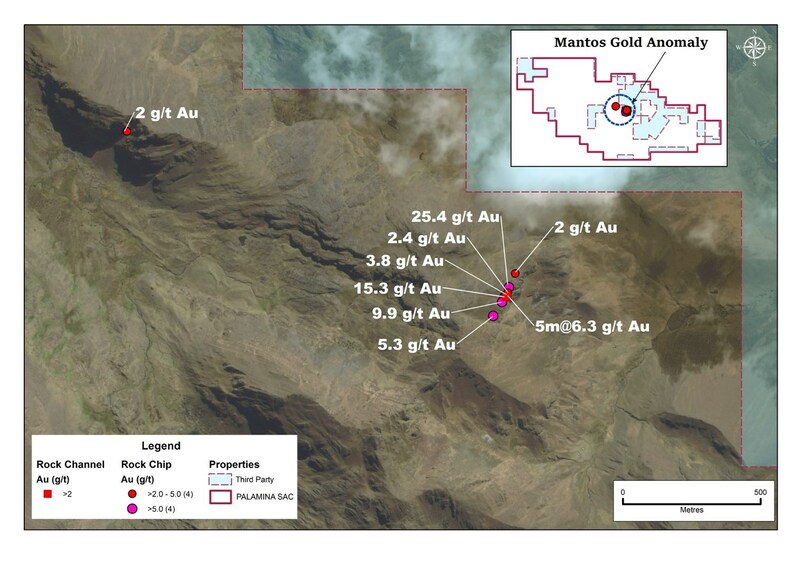 Further sampling is planned along the shear zone within the Aurifera concession to determine the extent of the gold mineralization. Bendi Gold Project: Palamina holds title and application rights to 18,900 hectares at Bendi which is located northeast of the Coasa Gold Project in the POGB. Palamina's exploration efforts to date have focused on 2 highly prospective district-scale structures as identified by Palamina's field teams: 1) The Carol structure is a >15 km long NW-SE trending shear zone parallel to the core of an anticlinal feature which transects the southwestern sector of the Bendi concessions and; 2) The Mantos structure is a >7 km long shear-zone trending sub-parallel to structure hosting the Benditani gold mine. At Mantos the host lithology is composed of intercalated siltstones, slates and quartzitic sandstones of the Sandia Formation. Hercynian-aged tectonics have resulted in a complex combination of NW-SE trending reverse faults, minor thrusts and NE-SW trending faults producing present day Andean-trending shears, open-folded anticlines and synclines. Relating to the regional-scale shear zone structures, gold mineralization is associated with oxidized sulphides in relatively narrow quartz-gold veins and veinlets which collectively occur in uninterrupted packages hosting sets of discontinuous and polydirectional veins. *Selective samples are not representative of the mineralization hosted on the property. Follow up geochemical rock-chip and channel sampling along the Carol and Mantos structures is planned to further evaluate the extent of the precious metal mineralization along strike to the NW and SE. Palamina's projects in the POGB have never been drill tested. Palamina Corp. quality assurance/quality control (QA/QC) protocol is administered on all its exploration projects. Prior to delivery of field exploration samples to the analytical laboratory and with the objective to provide an independent check on precision, accuracy and contamination in the laboratory, Palamina QAQC staff insert coarse blank samples, field duplicates and certified standards into the sample stream. To assure best practice compliance, assay results are only reported once the results of internal QAQC procedures have been reviewed and approved. All assays are performed by Certimin S.A. with sample preparation in Juliaca, Puno Province and analytical assays at the Lima office. Reported assay values are uncut. At the laboratory samples are dried, crushed, and pulverized and then analyzed using a fire assay - AA finish analysis for gold and a full multi-acid digestion with ICP-AES analysis for other elements. Samples with results that exceed maximum detection values for gold are re-analyzed by fire assay with a gravimetric finish and other elements of interest are re-analyzed using precise ore-grade ICP analytical techniques.